Sold: Marc van Daal B Full Set - This set is a full B-set by Marc van Daal. The chanter is fully keyed and the set comes in a hard case. This unique set is an outstanding showcase of Marc's craftsmanship. The main stock is a hollow main stock made from African black wood. All key work is hand forged silver plated brass and together with the flawless African black wood it makes this set one of the most attractive sets I've ever seen. This set is brand new and it has been recently serviced by Marc himself. The bag has been seasoned, it has five new reeds and it was completely tuned. This is a great opportunity if you want a quality B-set and you don't even have to wait years for it until it's finished! Condition: This set is brand new: it was built a few years ago but hardly ever used. Materials: African black wood and silver plated brass. Reason For Sale: I want to buy a drum set and drum classes for my daughter. Sold: Tadhg Crowley D Full Set - (Updated to include original chanter) Set of Tadhg Crowley pipes from the 1920s/30s, Drones and Regulators. May be able to add the original Crowley Chanter depending on offers.�The Pipes have been used on some very famous recordings and concerts. You can listen to the Drones on the audio sample below recorded in 2011. They are very powerful but sweet, have been complimented on numerous occasions and used by many. Issues: As you will see from the Photos the Brass has split in 2 places on the Bass Regulator. Materials: Blackwood/Ebony, Brass and Ivory. Reason for sale: I feel these Pipes should be in the hands of perhaps a collector, or someone who would like to maintain them as a working set. I now use more of an electronic set up and don't have the time to keep the maintenance up so this set would suit someone who has the time to do so. Contact: Vinnie Kilduff at itamo@eircom.net?? Sold: Brendan Ring D Boxwood Full Set - A rare chance to get a concert pitch set entirely in boxwood! They are actually my own set, metalwork is brass, all key slots are metal lined. Bag is a new leather Kelleher bag with cotton velvet cover. The boxwood is stained with nitric acid to give a beautiful colour. The mounts on the drones and regs are boxwood but unstained for contrast, the chanter mounts are imitation ivory. Reg keys have coil springs and the chanter has a C nat key with a leaf spring. Mainstock is ebony. The set has great character, is easy to play, with a rich tone. Sold: Mickey Dunne D Chanter w Kelleher Bag & Bellows - Mickey Dunne concert pitch chanter 2006. Ebony and boxwood mounts, Brass, C natural and F natural keys. Lovely in tune chanter, easy to reed. Current reed one of my own, light and easy to play. Included in the sale is a 3/4 Kelleher bellows and bag, hardly used 3 years old. Selling as I have a full set. 1600 Euro for chanter, bellows and bag. Sold: Adrian Jefferies D Drones - I am selling drones made by Adrian Jefferies in 2016 complete with a leather bag made by Aaron O'Hagan in 2017. They play well and are in good condition. Rarely played, which is why I am selling. Sold: Marc van Daal D Full Set Ex. Chanter - Full set by Marc Van Daal, without chanter, made of Ebony with silver-plated metal pieces. Bellows, parts and connections made by Cillian � Briain and the bag is Kelleher (Cillian � Briain model) . The Chanter is not included. Condition: very very good. 6 months use. 14 months old. Son graduated to a full set. Reason for sale: My son graduated much quicker than expected on to a full set. This is a very good deal as they cost something like $3000CAD including the case. Sold: Michael Dow Bellows - I am selling my Michael Dow uilleann bellows, same model currently being played by Jerry O'Sullivan. I purchased it new from Michael in 2012, used them with my Quinn set of pipes up until 2015 when I sold off the Quinn set. Have used them since with my small pipes, but they deliver way too much air for smaller capacity small pipes and recently purchased a 3/4 size set of bellows for the smallpipes, making the Dow bellows available for sale. Undoubtedly the most comfortable and efficient bellows on the market. The pads are made from a black, woven man made fleece that is primarily used for saddle and harness padding applications. It is an exceptionally durable material. The elbow pad has three separate parts: fleece on the front, an inner cushion and a 4 oz leather back. The body pad is a two part construction with fleece on the body side backed with 4 oz leather. The 3/4" wide arm strap, 1" wide body belt and 2" wide hinge are made out of soft, exceptionally strong nylon webbing that is very nearly indestructible. The valve assembly is air tight and maintenance free. The valve flap is durable silicone rubber and attached to the black Delrin holder with two small brass escutcheon pins. The valve/clapper connection is made through a two piece, hand made brass flange. The cylindrical part of the flange extends down into the clapper's valve hole and the flat part of the flange extends out on the face of the clapper. Softened beeswax is used under the flat and cylindrical parts of the flange as bedding to assures a fit that is not affected by the wooden clapper's slight seasonal movement. This arrangement makes for a valve system free of air leaks. The custom made brass flange is uniformly round and its inner sealing surface smooth. Two coats of Barge brand contact cement coat each surface that provides a flexible, airtight and nearly indestructible barrier. The gusset is airtight and never needs seasoning. The leather gusset is two layers thick. The inside layer is sturdy 4oz. airtight leather that is glued to itself at the narrow hinge end with a 2 1/4" long overlap. The outer layer of 1 1/2 oz. black, lightweight garment leather is then glued over the inner gusset - rough side to rough side so its smooth side faces out. This is the part of the gusset you see. The garment leather ends also meet at the narrow hinge part of the assembly and are glued in an overlapping fashion and staggered with the inner gusset overlap. When finished, there is a total of nearly 7" of glued, staggered overlapping leather at the hinge end of this gusset! No leaks are possible. The clappers are made from clear, straight-grain, defect-free, flat-sawn domestic cherry. Dow uses this wood for its density, stability and mechanical holding properties. I spend a lot of time and effort making sure that the wood's grain runs horizontally, or parallel with the clapper's width to insure clapper strength. The black leather cover air hose is detachable for easy storage and its length is adjustable to suit your body type. It is made out of 4 mm wall, red latex rubber and is flexible enough to easily conform to the shape of your body and will not kink. A plastic PVC fitting (female) has been forced into one end of the hose and permanently glued to it. On the other end is a male PVC fitting with its outside end wound with waxed hemp for insertion into the copper pipe silver soldered into the cast jeweler's bronze exit pipe plate. The round, hand cast jeweler's bronze sleeve guard was designed by Dow, copyrighted in 1991 and is unique to these bellows. It has a heart motif around the outside edge, and it will keep your shirt sleeve from being sucked into and clogging the valve hole while playing. The fancy hinge name/date plate is also Dow's design and cast out of jeweler's bronze as is the back exit pipe plate. These are hand cast in Maine using the lost wax method. Sold: Bruce Childress D Practice Set - Childress D chanter with keys in cocobolo along with a childress cocobolo bellows and brown leather bag made by Michael Mac Harg all circa 1998 in excellent condition. Haven't been able to play in many years due to permanently damaged bag arm shoulder. Video link demo by Rick Kemper of chanter in this post. Sold: Michael Hubbert ¾ B Set - Up for sale is my B 3/4 set made by Michael Hubbert in 2012. I am the original owner. Condition: The set is in excellent condition, and sounds and looks fantastic. Michael's craftsmanship is top notch! The chanter is based on the Egan B but slightly shortened to play at A440, and has F and C keys. Another cool thing about this set: the chanter reed, baritone reg reed, and tenor reg reed are all the same design and are interchangeable. Also included is a spare reed and quality viola case. Materials: ebony, sterling silver, and mammoth ivory. Reason for sale: Playing the flute pretty much exclusively these days. This set needs to be played! Sold: Marc van Daal D ½ Set - Selling my Marc van Daal 1/2 set in African Blackwood. These pipes are a great set for someone looking to upgrade to a full set later or who simply just want a 1/2 set. The pipes come with 3 chanter reeds. 2 of them needs to be worked on a bit, but one works great. 3 cane and 3 ez-drone reeds as well. The pipes also come with a sturdy case and some pipping supplies. The pipes are in great condition, the brass have a lovely patina and the black wood has no cracks. I'm selling these pipes to pay for college expenses wish I didn't have to but i don't have a choice right now. The pipes will be heavily padded in the case so shipping will not be an issue. Sold: Seth Gallagher C ½ Set - 1/2 set of seth gallagher pipes in key of C with wood chanter top and fully chromatic. Includes a hard case. Bought in 2004 new. Tried playing off and on but never stuck with it. Always gave me issues with my elbows which i always had problems with anyways. I'm a pro jazz drum set player in boston and music faculty umass dartmouth. Hockey didn't help the elbow strain either. Very low use. Everything is great with the pipes. Deserve to be played not sit on a shelf. Will only sell locally for cash. Sold: B.C. Childress D Practice Set - Student Model Practice Set by Bruce Childress. No issues. Reed likely could be retuned. 3 toddlers take up my free time when I am not working. Would rather these be played by someone than sit around. I do not have an audio sample. Sold: Bruce Childress D ½ Set - Hello - I am selling my Bruce Childress Half Set in D, African Blackwood and imitation ivory. They play nicely, but I am picking up a full set that I had made by Aaron O'Hagan soon and no longer need this half set. They were made in 2011 and new drones were added in 2013. A few minor cosmetic blemishes, but well cared for. Some more info from when this set was listed here previously by another seller... Blackwood, brass, imitation ivory trim. Baritone drone trim piece has a chip (cosmetic only), otherwise the set is in fine condition. Basic black ProTec case is included. The practice set (chanter, bag, bellows) was purchased new in 2011, new drones added in 2013. Bruce says the new owner will have his full support & service for the life of the pipes. Removed: Andreas Rogge C# Full Set - I have this set since 2007, a new L&M bag and stock cup recently put on so the set now feels very comfortable to play, all Keys re-padded so set is perfectly airtight, drone reeds replaced with natural cane reeds drones now have a lovely warm sound, chanter reed, tenor and baritone reg reed recently replaced. The set is playing perfectly in tune. I'm selling this set because I have a D and C set which I made myself and I don't have the time to play them all! This set would suit a good player, to buy a set like this from the maker with the 2 chanter keys and the flight case would cost �7850, I'm selling this set for �6800 plus shipping costs. 2. Condition: Set in like new condition. I am the sole owner and have treated it really well. - no dings or scratches, all joints solid & airtight. All keys operating perfectly. 4. Materials: Made from ebony, brass & imitation ivory. Rogge is a real craftsman. Has custom ebony inlays. Blocks mounted keys for durability. Bellows made by J. Schaefer to match this set, hand stitched leather, ebony and imitation ivory, with decorative inlay. The velvet on the bellows & connecting tube and bag cover is all the same material. Connecting tube velvet can be removed. 5. Reason for sale: Selling due to daughter's university fees and on-going mortgage payments. 6. A full custom set with bellows and hard case like this would cost around � 9300 new, with about three years waiting time. I am selling the complete package for �7800. Buyer pays shipping & insurance. Estimated � 100. Sold: Bill Haneman Narrow Bore D "Parlor" Set - Bill Haneman Narrow Bore D boxwood "Parlor" set with mini drone stock. 1. Up for sale is this lovely Haneman set with boxwood and imitation ivory mounts. If you have never heard or played a Haneman set, you are in for a treat. His sets are exceptional quality and craftsmanship. They are easy to play, have an especially sweet tone, and will last a lifetime (billhaneman.ie for gallery and sound samples). 2. The chanter is a narrow bore D chanter with three keys (Pat, please insert the appropriate key names, I have forgotten!). It also comes with extra chanter Reed's from Bill so you can choose which you might like the best. The chanter is well tuned and sings beautifully. 3. The mini drone stock was initially meant to be temporary, but the smaller stature of the stock and the tone of the two drones worked so well with the chanter I left it alone. However, if you ever wanted to upgrade the stock and add a bass drone or regulators in the future, Bill had planned to do so for this set eventually. 4. The bag and bellows are Rock solid and air tight. They are well made and as long as you care for them they will give you no air leaks or issues. As the mechanism that drives the instrument, they function perfectly. 5. Included is a very nice Viola case that I purchased from Amazon. I have modified it to hold the chanter in place and fit each component nicely. Sold: David Daye D Practice Set - Penny-Chanter and stabilized natural cane reed, Vinyl Bag, real wood-&-leather Bellows, all necessary connectors and parts. Bellows wood varnished. Also comes with a canvas carrying bag. Daye sells these for $568 on his site, or $388 in a kit that you can do some of the labor and build it yourself. I opted for the kit, and had it set up and regulated by John Liestmann of Houston. Why am I selling? I play piano, guitar, trumpet, all kinds of pennywhistles, but I can't play the pipes to my own liking and I'm tired of trying. Time to let someone else give it a go. Condition: Chanter is as new, excellent playing condition, all keys in perfect working order. Comments /issues: Both octaves in tune. Resonant and responsive chanter. Doesn't need much pressure for warm rich sound, bit quieter than D chanters. That's the charm of the flat pitch chanters, These were the original pitch chanters played in Ireland only semi-tone lower but completely different in character. Has a vocal like quality, but not way flatter in tone than modern concert pitch as some of the others i.e. C, B or B flat. Also as many might know but C# tone hole spacing is very close to D spacing so switching between D (for maybe sessions or live gigs) and C# (for solo, recording or home practice) is really easy. Although finger spacing almost the same although the overall sound is much warmer and resonant, as the original flat chanters like Coyne etc. It is robustly made and will last a very long time. Comes with original Haneman reed fitted and two extra (Haneman) reeds. Has the classic swan neck wind cap. Bill Haneman is a real craftsman and produces very fine workmanship. He said a few months ago he's not taking any new orders for about 2 years. So will give the buyer head start with the waiting time and money. Has B. Haneman's original name stamp and cracking small logo at top of chanter. Imitation ivory cap can be left on or off (as Wooff stye ) see photo.I have played this with a friend who has a G. Wooff C# chanter (waiting time is off the radar) and the tone, pitch,volume and sound quality are the same. Materials: Ebony, Brass & imitation ivory. Also has two dark brown natural hardwood inlays between ivory mounts top & bottom. Dark rich brown looks great with the ebony, but looks lighter in pics so they don't really do it justice i.e. Looks better in real life. Reason for sale: Raising money for daughter's college tuition. Not much else could get me to sell this chanter. Audio sample, Mikie Smyth probably finest C# player( reference The Wild Keys CD) playing this chanter before it was sent over to me. You can hear him commenting "Lovely!" then he continues to play some more. It's the kind of chanter you don't want to put down..
Sold: Cillian O'Briain D ¾ Set - Kíla piper Eoin Dillon is selling this very nice set in macassar ebony & brass. These are the pipes played on all the Kíla recordings. Sold: Martin Crossin D ½ Set - Made in 2013. African Blackwood with Brass. F and C nat and stop key. Air tight bag and bellows. Eezedrone reeds. Original cane reeds come with set. Everything in good working order. Upgrading to a Rogge Set and no longer require this set. Pipes have been well maintained and cared for and are in excellent condition. Sold: Rogge, Lynch, Britton & Gallagher ¾ Set - A 3/4 set of pipes with Andreas Rogge chanter, Kirk Lynch drones, Tim Britton regulators and Seth Gallagher bellows. Recently reeded by Michael Hubbert, this is a nice set of pipes that I don't play (I play the Lynch chanter) and I need to sell, as I would like to get a C set sometime in the future. Removed: Tim Britton C Chanter - Tim Britton chanter in C made of blackwood with four keys, a blackwood chanter top with a twist style stop valve, and two reeds. This is a great sounding, expressive stick with no issues at all. I bought it several years ago but have since acquired a full set, so this chanter needs to find a new home rather sit in the case unused. The reach is surprisingly easy and the chanter is very comfortable to hold, and the reeds are very easy as well. The keys are F, G#, Bb, and C (notes named as if it were a D chanter). It comes with two reeds made by Tim about a year or so ago. C chanters from Tim don't come up very often, and new this would cost around $2,200 with the stop-valve chanter top and extra reed. I am asking $1,800. I can send a sound sample on request. Thanks for looking! Sold: Chris Coe D Practice Set - I am selling this practice set bought the last year. The chanter (box keyless) is made in African Blackwood and brass, the bellows and Hand-Stitched bag are made by kelleher and they are in perfect condition. The reason to sell is unfortunately lack of time. Sold: Richard Patkos C Full Set - Made in 2013 from African blackwood, boxwood mounts and brass. I do not know the wood species of the mainstock. The chanter has 2 keys: C, and F. The set had less than 10 hours playing time after I began a complete clean-up and polishing. There is a new reed (~3 hours playing time) in the chanter replacing the one that died as a result of the original crossing of the Pond. The new reed is playing well in tune through both octaves. The current price on Richard's site for an equivalent set is �5480 (~$6500). Issues: The bass regulator is not playing as the corners of the reed have opened up. Reason for sale: I have a daughter in medical school, who is planning to get married in June of 2018. Impending poverty doesn't begin to describe the situation. Also, I never was comfortable with the full set after playing no more than a half set for seventeen years. Removed: Tim Benson D Chanter - This is a concert D chanter by Tim Benson in blackwood and brass with mounts made of a lighter-colored wood. 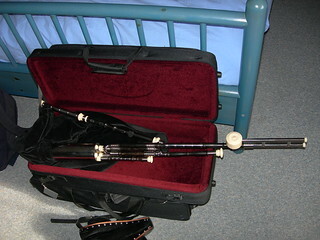 I bought the chanter from Tim about 8 years ago and am selling it because I am not playing it much. The chanter is thoroughly keyed with a playing reed , has a slight curvature, and has minor normal wear. Am including an extra reed. Asking $975 or best offer. However, he's stopped taking orders, so hopefully it'll be someone's lucky day. I'm in the Santa Cruz, CA area. Very wary of shipping these, but may consider if buyer pays costs/insurance, etc. Sold: Andreas Rogge D ½ Set - I have a Rogge 1/2 set (ebony) for sale (key of D) with silver bands. The chanter is fully keyed and the keys and top are also silver plated. It comes with a Kelleher brown ash bellows and hard case and extra chanter reed, along with a bag and popping strap. I was enamoured with the sound and wanted to learn but just haven't had the time- I have only played it about 2-3 hours worth since I bought it two years ago. Sold: Seth Gallagher D ½ Set - Half set of Seth Gallagher Uilleann Pipes in (Concert "D") blackwood and stainless - Bag, drones, bellows, and chanter. Sold: Neil O'Grady D Full Set - Full set in D made by Newfoundland pipe maker Neil O'Grady. They were purchased in 2003 from O'Grady in 2003. The set includes chanter with three accidental keys (F nat, C nat, G#), leather bag, bellows, three drones (D), three resonators, and a box of extra reeds. Includes a case with fitted foam. All pipes contain the original reeds made by O'Grady. Reason for sale: I play five other instruments - I'm not going to be able to learn the pipes in this lifetime unfortunately. Sold: Andreas Rogge B Chanter - Master Edition Flat Chanter in B. Made of Plum wood. F and C keys with leaf springs. Excellent Condition. My father has arthritis and can no longer play. Sold: Richard Patkos D Full Set plus E Regulator - Made in 2012 from plumwood, ebony mounts and brass with a walnut main stock. The 4th regulator plays the note E. The chanter was made in 2015 and has 4 keys: Cnat, Fnat, G# and A#. The windcap and the stock-end bass drone part are new and were made now in May 2017. Bellows are not included. Condition: Good, minor cosmetic wear. Issues: a rubber band (O-ring) on one regulator key. Reason for sale: I actually had no reason to sell the set but Richard got me curious about a new one with different specifications and he's currently making it. I won't be needing two sets in the same key. Sold: Seth Gallagher D Practice Set - In exceptional condition with faux ivory, single key, chanter in D, two reeds. It's about 4 years old and I've simply not put in the time to justify any longer. I'm a flute player. No case. New was $2,300. Seth no longer is making pipes. Sold: Andreas Rogge D Chanter - I have an Andreas Rogge D Chanter for sale. The chanter is made from ebony and artificial ivory with sterling silver. It has a stop key and three keys (C natural, F natural and G sharp). It also comes with the back D tuning screw which is very handy. It still looks like the day I took it out of the box. It has a bright and full sound as you can hear in my video. It is fully chromatic and it can go all the way up to the 3rd octave quite easily. I'm selling it with a spare reed. It looks the part - the sterling silver gives it that black and silver look which I much prefer. I have used this chanter in competitions, I have won numerous titles with it including the All Ireland Senior Uilleann pipes both fast and slow airs. It has served me well! The reason I'm selling - I have two D chanters now, I received one from Cillian O'Briain which I now play more often. And as I have just received an order for a full set of B pipes by Andreas Rogge, the time has come to part with this chanter. I no longer need it, and so I sell it rather reluctantly. I would like to see it go to a good home. Give me a shout and we'll chat. Sold: Andreas Rogge D Chanter - windcap includes a stop key. Keys: four hand forged chanter keys (C natural, B flat G sharp and F natural); E flat ( ghost D) is easy to play but block is on for extra key if needed�( key work is just great. )Has Rogges's adjustment screw to cure sharp back D- which works just fine. Condition: excellent playing condition, all keys in perfect working order. Comes fitted with Rogge reed and two extra Rogge reeds- ideal for choosing best reed for your playing pressure. Swan neck wind cap. His maker's stamp on chanter.Will also save buyer the waiting timed money on a new Rogge chanter. Materials: Ebony, Brass & imitation ivory. Sold: Chris Bayley D ½ Set - This is a lovely set of pipes, in good condition, with a clear tone to the chanter in both octaves. They have served me very well for 11 years of piping! Would suit beginner/intermediate player. Chanter, bag and bellows bought as practise set and 3 drones added later. Ebony chanter has C nat key and blocks for other keys to be added. Brass and imitation ivory trim throughout. Chanter reed by Alan Burton, synthetic drone reeds by Eezeedrone. Elbow and hip pads on bellows are simple foam - not glamorous but they do work! Baritone drone has a slight crack where reed sits and has been fixed (by me) using Sugru to keep the reed permanently in place. This drone is less reliable than the others, which play very consistently. Please contact me directly for more photos and sound files if required. Sold: Makoto Nakatsui D Chanter - Made in ziricote and brass with C natural and F natural keys. It's approx 2 years old I'm selling it for financial reasons. Removed: Old 8 Keyed Flute - Estimated to be from the 1860s by Hammy Hamilton and John Gallagher. Recently fixed up by John Gallagher. In good condition. Plays well and all the keys work well. It's blackwood. Couple of old cracks that are repaired and the cracks are in spots where the flute is lined so they wouldn't leak either way. I have 4 flutes and need to get rid of at least one. Removed: Chris Bayley D Practice Set - Irish pipes made by highly praised Uilleann pipe maker Christopher Bayley, consisting of an bag, bag cover, bellows, connectors, spare tubes, spare reeds and chanter. The Chanter is ebony with a brass C natural and mammoth ivory fittings. Its also has the blocks for additional keys to be fitted and features Chris' comfortable thumb rest and elegant shape. It also has an additional 5 reeds all made by Chris and has a Steve Turner reed in the chanter. There is also so spare tubes at different lengths for connecting the bag and bellows. The chanter reed is very soft making it very easy to play and reaching the second octave is easy, it also has a solid hard bottom D.
Please contact me for any other details, sound clips or extra photos. Need to sell to pay of my new set. Removed: A. Ginsberg C Full Set - This is a lefthanded set, custom-made in 1982 and I have since been the sole owner. Alan Ginsberg of N.Wales has been a reputable pipes-maker since the 1970's. The pipes are in rosewood, brass and imitation ivory. Overall, they are in very good condition. The chanter has three keys (the equivalents, on a D chanter, of F, G# and C keys). Also included in the sale is a compatible, un-keyed but reeded D chanter and another, older, unreeded C chanter, both by the same maker. The regulators and�the C and D�chanters have had new reeds made and fitted by Alan Burton of Cornwall in 2011. Some fine-tuning to the regulators is required. The bag has also been recently replaced by Bennett Pipe Bags in Scotland. They come in a strong, fibreglass, lockable case. A leather 'piper's apron', a reed knife and a copy of Dave Hegarty's 1980 reed-making guide are also included. I have not�played pipes regularly now for some years. Consequently, I would like them to go to a younger, more active musician. The sound files play the following, to the best of my ability: the C chanter, C chanter and drones, the C chanter and regulators. The set is located in the U.K. Removed: Richard Patkos D Boxwood Chanter�- comes with 3 Reeds total. Condition:�A little over 1 yr. old. Materials:�Beautiful European Boxwood concert-pitched chanter. Mounts are made of Horn. Brass. Reason for sale:�Sad to see this great chanter go, but I'm wanting to buy a full and have no need for another chanter! Removed: Seth Gallagher D ¾ Set - Concert pitch 3/4 set made by Seth Gallagher. Brass and ebony with imitation ivory mounts. Set in excellent condition. Removed: Bruce Du Ve D Chanter - a rare opportunity to purchase a Du Ve chanter. The chanter is made from Blackwood and is offered for sale because I have a few too many chanters in my collection and need the cash!! Removed: Seth Gallagher D Practice Set - Seth Gallagher uilleann pipe practice set (concert pitch D) for sale: The practice set, in brass, was fabricated entirely by Seth Gallagher and includes the bag, bellows and chanter with blocks for mounting four keys. The practice set is in mint condition. Reed is not included. Removed: Stephen Vickers C Chanter - I'm selling a C chanter, made for me by Stephen Vickers 2 summers ago. It is made from brass and ebony. I got it for a project I was doing at the time but now I don't need it anymore and want to start a new project. It has two keys on it ( C, F). It was recently reeded by John Mitchell. It is in perfect condition and is playing very well at the moment. Sound files and photos available on request. Removed: Ray Sloan Full Set + Extras I'm selling a new set of uilleann pipes made by Ray sloan. Materials: African blackwood, imitation Ivory, nickel silver. Drones: Bass, Baritone and tenor. Regulators: Bass, Baritone and Tenor with tear drop key design. Bellows: with pads for comfort. Custom specification flight case with moulded and fabric lined royal red interior to house pipes fully assembled, bag, bellows and plenty of room for low whistles, etc. This case is an ATA style flight case designed for air travel and will be supplied with padlocks and keys - Case containing reed making equipment to get you started. DVD's: The heart of the instrument 2 dvd set, Pipers choice 1 and 2, Volumes 1, 2 and 4 of the uilleann pipe tutorial series (for teaching someone else), Planxty 2004. The reason I'm selling to be truthful is not due to looking for another set as posted on another forum. I've had an accident which has caused weakness on the right hand side of my body which means playing a set is difficult and rather painful. and now makes a few things more difficult as a blind young person with a white cane. so am selling up. These pipes are 1 month old so are as new only played twice at home in a smoke / pet, etc free environment. I'm looking basically to recover some of the money so am selling at £5700 or near offer. I will deliver if necessary at extra cost however due to the weight of the set with the case and extras it would be a little difficult traveling by train, etc. Ideally buyer to collect. Due to weight, international shipping will not be possible due to expense of insurance and weight costs. Please note I will only accept interest from interested parties within the UK and Ireland who are willing to collect. Removed: Simack D Full Set - Full set of Uilleann Pipes in the key of D, manufactured by Sue & Ian Mackenzie, Blackheath Australia under the name SIMACK. Constructed in Red Lancewood, Brass and imitation ivory. Features a 4 key Rowsome style wide bore chanter with wooden windcap. Straight bar bass regulator, teardrop regulator keys and straight bass drone. All cane reeds, chanter reeded by Alan Burton. Nearly new bellows and two bags from CJ Dixon; the spare bag enables the set to be easily used as a practice set if required due to space constraints. In generally excellent condition, very few use marks and some nice patina on the brass work. A really lovely set of pipes with excellent workmanship and great playability. One of the bass regulator keys needs re padding to be 100% reliable. One of the chanter keys is a little sluggish. I use them insufficiently to warrant keeping them, though a very reluctant sale as they are a fantastic instrument. Removed: Kirk Lynch D Chanter 2010 Kirk Lynch Concert D chanter. Blackwood (one of only two Blackwood chanters he has made). Keyless with blocks. Brass top and bottom ferrule. Mounts are Boxwood. Has less than 6 hours playing time on it. Is in immaculate, as new condition. Price new was $1050 + shipping. Will sell for $1000 and I pay the shipping. Removed: Richard L O'Mealy C One Regulator Set - Hi There everyone, So what we have here is a unique, one of a kind set of Uilleann pipes built in 1901 by the make R.L. O'Mealy of Belfast. The set has been identified from a picture in the Sean Reid society journal as the set from Memo. Link to picture below. The set came to me over a year ago now after being found by a widow under a bed in Belfast, After bringing the set home with me to Clare it came to the attention of Ronan Browne and following a visit to Ronan 's house and doing long comparisons with the photograph it was decided that the set in front of us was indeed the lost set featured in the Memo picture. After identifying the set I set about looking to see if it was possible to get the set restored and playing again as Sadly not all of the set had survived its 115 year life. So the set went off to a specialist and after many hours of labour I received a phone call 2 days ago on the 19th of April to say the set was playing again and ready for collection. At this point I have decided that I needed to make a decision. Was the set going to be for me to keep, play and cherish or was it going to be for someone else? So after a lot of thought I have decided to offer the set for sale for someone else to take up. I have only been playing the pipes for a short period I would feel happier and more comfortable learning on a D set rather then a flat set and I feel that such an iconic set should be played by someone more deserving of it then I.
Ronan Browne is very excited about the appearance of this set after it has been lost for so long and is very happy it is up and playing again. It is an iconic set of great historical importance as it is very early in O'Mealy's career when he was still experimenting and it was before he went on to do his Taylor style sets with the double bass regulators and instead follows the normal configuration of tenor, baritone, bass. Its only a personal theory and there is no way to substantiate this but it seems odd the set was built in 1901 and the picture we have is around 1905 so I personally believe that this was built as O'Mealy own personal set and played by him for a few years. Of course I could be wrong. So onto the set itself. The set when I found it was not playing at all and consisted of the original leather bad and bag cover and in-between another kind of line material separating the two. An O'Mealy chanter in Boxwood. Now this is an Original O'Mealy chanter but it is clear that it is a replacement chanter, probably attached to the set by himself but it is a later design. Now remembering that at the time of the sets construction his pipe making was in its infancy and he was clearly experimenting trying to find his style and so it is possible that the original was not the best chanter and who ever eventually bought the set may have asked for a new chanter at a later date in O'Mealy's career. This however is just speculation as there are several other reasons as to who the chanter was replaced. The mainstock is original and dated and stamped and has a think piece of horn were it connects to the bag. There is also the iconic one off Baritone regulator which has an upturned tube and puck, as stamped and a baritone reulator. The tenor drone is sadly not O'Mealy's work but was clearly taken from another old set and plays well with this one. There is a dummy drone (chair leg) blocking were the tenor reg would go and the bass drone sadly lost has been plugged. The original hand stitched bellows is also with the set. So the work that was done to get the set playing including new reeds, re-hemping, cleaning, a new part was built for the tenor drone slide to mount on, a new Keller Bag and a lot of hours of labour. The original parts that were replaced have been kept and are with the set. As I said, the set playing as it is but if it was to be returned to its former glory the next job would be to build a new Bass drone and the two missing regulators. An interesting point about the fittings, the thick ring around the stock is clearly horn but the other fitting at first were thought to be ivory but have in-fact turned out to be a very early form of plastic which I'm was identifiable as it was made up of 30% celluloloid!! This is not only interesting but also handy as moving a set with ivory fittings can be problematic. I cant seem to load images to this advert so when I have it advertised on other site I will copy in the links or if anyone Is interested I can forward them on any Pictures they would like. I also have a short video clip of the pipes being played which is available on request. If you are interested in the set please get in touch with me with SENSIBLE OFFERS ONLY please. You can contact me via email at ashorourke@hotmail.com or you can call me on my mobile 00353(0)874358244 or send me a PM. Removed: Kirk Lynch ½ Set - For sale is my beloved 1/2 set in D by Kirk Lynch. The ebony drones were made in 1996 and are the only set I believe that Kirk has made with nickel silver. The bass drone was overhauled in 2008-9 after the humidity of southern Vermont caused a stress fracture in the silver ferrule on the main section of the big loop, necessitating replacements which Kirk did in brass. This can be seen in the photos. These drones were also made originally with the silver-mounted chanter top included here. The chanter stick included is newer and was made around 2000 with brass keys and a wood top with no stopkey. Wishing to keep the silver stopkeyed top, I swapped the sticks with one another since they both fit perfectly fine, and sold the older stick with the newer top. Together, the stick with the rest of the set renders a sort of two-toned look between the silver and brass. The bellows were made in 2006 by Michael Dow and have worked beautifully from the get-go. The drone reeds are made all-new within the last year by Ted Anderson out of his finest California cane, which is the best cane available anywhere in the world. The chanter has been recently supplied with two new reeds made by Kirk out of 10-year-old Anderson cane, and are according to Kirk "some of the best reeds he's made in over 35 years of reedmaking." Kirk also attests that this is one of the very best chanters he's ever made, and with the newly-reeded drones the set is sounding and functioning absolutely the best it ever has. I've spent a very happy 7 years with these beautiful-sounding pipes using them for all sorts of stuff all over the place in all sorts of weather (they travel GREAT! ), and am only selling them now to help finance a new full concert set. I'm asking $5000, which covers the $1000-or-so's worth of work I put into having the set overhauled/upgraded over the years, the Dow bellows which new would be well over $600 by now, and of course the priceless California cane reeds which are worth the price of admission alone. Any other pix/sound clips please call or email, happy to play the set over the phone. Sold: J.J. Maloney D Full Set - The set is constructed of rosewood and brass and has been played in and very well looked after.The pipes were made by J J Maloney in 1979,These pipes were professionally made unlike some of the cheap mass produced ones on sale from certain countries. These pipes have won two All Ireland championships.And were played by a 12 year old in this years All Ireland Fleadh and came fourth.The pipes have a lovely smooth sweet tone and a nice clear second octave. The drones are good,regulators may need new reeds or tweaked,bag recently replaced and is air tight,comes with a sturdy case. Sold: Martin Preshaw C ¾ Set - Made from blackwood, alternative ivory and brass fitted. Key blocks are in place for adding keys later. Sold: C.J. Dixon / J. Addison D ½ Set - African Blackwood, brass, synthetic ivory mounts. New Chanter Reed, almost blown in. Cane Bass Reed, easy drone Baritone Reed, North Umbrian Tenor Reed. Dixon Chanter, bag, bellows. Addison drones. Plays very well, no leaks in bag. Played very frequently until recently when I purchased a full set. Sold: Taylor Style D Full Set with Hubbert Chanter - I am looking to find a new home for my old Taylor-style set. This has been my main set of pipes for quite a few years, and I have played them regularly across Ireland and the UK. I absolutely love these pipes, but as I have recently acquired a full set made by the Taylor Brothers themselves, it is time to pass them on to a good home. About the set: This is a beautiful, fully restored and reeded set of pipes dating from the early 1900s. For those who love historic sets and Taylor-style work as I do, you will struggle to find a better looking, sounding and playing set than this one, and most importantly an historic set that is playing straight out of the box. The condition is excellent, and when polished up it is often mistaken for a brand new set of pipes. Several top pipers have commented on its lovely tone (it's often said to have 'that old sound', if you like that kind of thing as I do). The drones and regs are identical to a set pictured in the hands of a piper in the famous group photo on the cover of the 'Wheels of the World, vol. 1' record (I'm not saying this is that exact set, only that it is by the same maker and therefore dates from that era). The body is in ebony, nickel silver and bone, and the mainstock is oak. The regulator mounts and bass drone puck are original ebony. It has the Taylor-style triple bored bass drone and wrap around bass reg. The drones are beautiful and warm, and the regs reeded to a mellow the volume so there is a lovely balance with the chanter and drones. Chanter: When I acquired the drones and regs, they came with the original chanter top but no chanter. In 2014, I asked Michael Hubbert to make me a chanter in the Taylor style reusing this original old chanter top. It is a beautiful bright chanter that blends perfectly with the rest of the set both visually and musically. It is the first (and as far as I know the only) block-keyed Taylor copy Michael has made, and was based on a true Taylor he was restoring at the time I ordered. The 5-keyed chanter with stop-key is in ebony, nickel and mammoth ivory, and while Taylorish on the outside has Michael's modern bore based on Crowley. Sold: Ray Sloan A Small Pipes - Ray Sloan ABW small pipes 2001, bellows blown, key of A. Includes custom crushed velvet bag cover and bellows pads. Also custom mahogany dovetailed case. Excellent condition, sweet sound. My kids would not appreciate them so off they go as I am concentrating on the Great Highland Pipes. $1650 or best offer, no need to wait 6 to 8 months for Ray to make a set. More pics available upon request. Removed: Ronan Olivier B Chanter - Built in 2015 (original bill available). Made of indian ebony from the beginning of the XXth century, faux ivory and stainless steel. All usefull keys are present (D flat, E, G flat and A flat octave), even the stop-key. Condition: Perfect condition, with the original reed and two additional reeds from Didier Heuline and Alan Burton. The main reed has a great tone and plays well until the third octave, as well as the others. Reason for sale: I'm selling this chanter with regrets beacause I recently bought a full-set. Sold: John Pederson D ½ Set - I'd like to list my 1/2 set of John Peterson (of Amazing Grace Music) pipes for sale. I'd like to ask $1100. They are currently playable, but there are loose parts so will need re-gluing and some love to get playing perfectly. They have reeds, but again, it will need attention. They feature chanter shutoff, mechanical popping valve and blocked for keys. I purchased them from the original owner's son. Sold: Kirk Lynch D ½ Set - I'm selling my Kirk Lynch half set, I bought these pipes used about 2 and a half years ago through Kirk himself and he went through and did some maintenance at the time and gave them a new chanter reed as well as synthetic drone reeds that have been playing really well for me. It's a Coco Bolo set with a 3 key chanter (F, G#, C) and a wooden chanter top. Selling them because I'm buying a full set and want taylor style regs which kirk doesn't do. The only issue I'd mention is other people have told me the bellows are a bit stretched and could be more efficient but it hasn't been a problem for me. Includes a Doscocil hard case that I will ship them in. I'm asking $3300 USD which is what I paid for them. Sold: Michael Vignoles D Practice Set - New reed. Brass, faux ivory, no keys. See attached vid. Removed: Joe Kennedy C# Ful Set - Full set of pipes in C# by Joe Kennedy, in the Coyne style. Ebony, boxwood, and brass. Chanter has 5 keys plus stop key. Chanter and drones constructed in 2004, tenor and baritone regulators in 2008, bass regulator added 2013. Set fully reeded by the maker, and in good order. Removed: Ginsberg & Spillane Concert D ½ Set - These pipes have Alan Ginsberg drones and a Davy Spillane Chanter. I haven't played these pipes much since I got them - I'm a former Grade 1 highland piper and always struggled to adapt to uilleann piping. being that my big pipes are one set custom made and one set an antique I know how to take care of my instruments and these pipes, like all my others have been well looked after. Now with a young family I don't have the time to try to play anymore and would prefer them be used by someone who will cherish them rather than have them sit unused. The drones were made by Alan Ginsberg of North Wales in 2004. The drone stock is rosewood. The drones are African Blackwood with brass and mammoth ivory mounts. Overall, they are in very good condition. The have both cane reeds and a set of composite reeds made by Bruce Childress. All the wrappings and joints are straight and airtight. They hum sweetly when blown. I love their tone. The chanter is African Blackwood with a brass neck and imitation ivory cap and was made by Davy Spillane. It has one key and is currently reeded with a custom Spruce reed made by Michael O'Donovan. These reeds are superb. Eric Wrigler has played one for years and due to the nature of the spruce they aren't affected by climatic changes anything like cane. I've played it in dry, warm California and damp Melbourne, Australia without having to adjust it. The chanter also comes with four spare cane reeds, two from Alan Ginsberg and two from Davy Spillane. The bag was made by Mike McHarg of Vermont, USA in 2006 and tied in by Michael Hubbert in California at a Southern California Uilleann Piper's Association Tionol. The bellows were made by Alan Ginsberg and are airtight and have a good capacity which makes for easy playing. When you're playing these the bag feels tight under your arm and easy to hold in place. They come in a strong padded customised viola case with an inbuilt humidity gauge that has an external side pocket; two hand-grab straps and a shoulder strap attachment. Coming in the case will also be a leather popping strap, a cork for the drone stock so they can be used as a practice set. There's also a reed mandrel, wax resin, a humidifier (DIY but it works a treat), The Handbook for Uilleann Pipers, Clarke's Uilleann Piper's Tutor, a copy of Patrick Touhey's Hints To Amateur Pipers & finally The Dance Music Of Willie Clancy. I don't have a sound recording of the pipes but Pat D'Arcy and other members of the Southern California Uilleann Piper's Association have heard and played them and will verify their great tone and the chanter's excellent voice. These pipes have been kept in airline socks for protection when not in use... those free heel-less socks you get on planes do have at least one use! Sold: B.C. Childress D Full Set - A full set of uilleann pipes in 'D' made by B. C. Childress. An instrument I acquired about six months ago and have given a thorough restoration, however, I simply don't have the time to learn to play the pipes(I play hurdy-gurdy and flute) and so I am reluctantly putting the pipes back on the market. The instrument comes with two chanters; one by Childress with four keys and a second single keyed chanter made by the Irish luthier Kevin Thompson. Both chanters are from African Blackwood and are supplied with their individual brass chanter tops and cut-off valves. The drones and regulators are also turned from ABW with brass ferrules, keys and imitation ivory decoration. The bag has recently been replaced and the bag cover is new. The bellows is also new and in perfect condition. The instrument is supplied with a carrying case and a selection of reeds. A couple of photos are attached. Any further questions please contact me. 3500 Euros ($4500 US) The buyer will be responsible for the transport costs. Sold: Patrick Sky D ½ Set - I'm selling a Pat Sky half set � purchased new from Pat in the fall of 2011. Chanter has 3 keys. Set is fully reeded and playing well. Heavy duty carrying case is included. Buyer pays shipping and insurance. Email me for details. Sold: Seth Gallagher D ½ Set - Ebony with nickel silver. 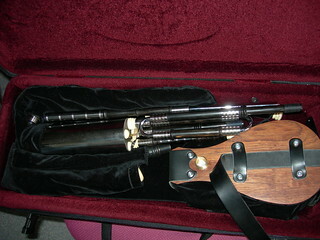 Sold: John Butler D Practice Set - I want to put my daughters practise set of pipes up for sale. They are: Practise set (D). Maker: John Butler of Achill, Ireland. Bought September 2011. One careful female owner. To include hard case. Based in Dublin. PayPal not accepted. Sold: BC Childress D ½ Set - BC Childress concert pitched 1/2 set for sale. "BC Childress 87 2003" is stamped on the chanter. The pipes are in amazing condition! Pretty much as good as new! Please feel free to email me with any questions. Will ship worldwide. As I am a musician, I know how to pack instruments for shipping! I look forward to hearing from you. Sold: Robbie Hughes and Peter Hunter D ½ Set - This is for a blackwood/ brass/ ivory and imitation ivory set. First and foremost this is a player's set and is fully reeded, in good condition and sounds great. I will describe it below. Only ever owned by me and made in 2 main stages as I developed as a piper and moved around. The below/ bag/ mainstock and baritone drone were all made by Peter Hunter in Yorkshire- the brass is hand rolled and the mounts are real ivory on the drone with lovely grain. The bellows have boxwood details and an interference fit connection into the bag. These were approx 1996 and despite this age they are in good condition, airtight and should last for ages yet- well looked after! The chanter, tenor and bass drone are all made by Robbie Hughes in Northern Ireland and the tenor is a replacement for the original Hunter tenor drone which I managed to break. The set looks good and feature blackwood/ brass/ imitation ivory. None of the mounts have aged/ yellowed. The chanter has a wooden cap with a single C key and has blocks for full key additions. The reed is approx 1 year old and playing really well, fitted by Robbie Hughes himself. Good hard D on it and plays the full 2 octaves. There is no damage I can see and the set is in really good condition and has been played regularly and kept indoors/ warm. If you have any questions please ask me- my daughter is trying to get some YouTube sound/ vision sorted but there are some photos attached. I am looking for �2500 or equivalent (ie approx 3000 Euro or $4000). Consider current prices and waiting lists for respected makers and I think this is fair. I am selling as I am moving progressively away from pipes and enjoy my banjo far more these days!!! Removed: Arpha D ½ Set - I am selling my half-set of uilleann pipes, made by Arhpa. It's made of african blackwood, stainless silver, and vegetal ivory. It's a wonderful instrument ! Alain Froment gave one of his own chanter to the lads, and they drilled theirs on his model. It sounds great and I never had any problem with the reed or with the tuning. It is very reliable. Actually, I am so pleased by this instrument, that I own another chanter by Arpha that I keep for my own. I'm selling it because I ordered a full set from Gallagher about three years ago, as I wanted to upgrade my set, and Arhpa had been unreachable for some time, because of restructuring their business (they are called Arpa now, and are back in the business). As you can see, there is only a little ending-ferrule on the bass drone that has broken (I still got it, it isn't lost). It is a sort of cap, and it can be replaced (must ask to the lads). The main stock also have a few thin scratches, because of playing time, but honestly, it is nothing and I even think a steal cleaning product should erase them. I sell those pipes for 3900� (~5000 $US). Their original value was 4500� (~5850 $US). I am open to discuss on the price. I am currently in New Caledonia, otherwise, I am from Brittany. Pitch: concert D with all the keys and stopkey. Made in ebony. Bag from Jackie Boyce and bellows from Simon Hope. If you want the set extended to half or full,Evertjan will make them. Condition: In perfect shape, playing easy and in tune. Nice mellow tone. Professional set. Materials: ebonywood,imitation ivory and silvered metal. Reason for sale: I waited two years for this chanter and in the mean time ,having increasing problems with arthritis. Sold: Andy Faden D ½ Set�- In Ebony & Brass made by Andy Faden of Bedford, England. The chanter was reeded by Andy and has a C natural key fitted.Andy's pipes share most of the same characteristics that you will see and hear in a Cillian O'Briain set of pipes and his craftsmanship is excellent. These pipes were recently overhauled by Andy, they are playing beautifully and in excellent condition. Spare reeds and case included. Regulators for this set are being made by Andy Faden and can be purchased in 2014. Listed: 06/26/2012 Sold: ??? Sold: Jim Wenham D Chanter�- Ebony, 2 keys: f natural and high c natural. Excellent condition, 2 owners. Selling to finance upgrade of current pipe set. Located in Ireland. 2 brand new reeds can also be purchased for an additional �100. Sold: Ray Sloan D Practice Set - In excellent condition. Sold: David Quinn D Practice Set - This is a David M. Quinn practice set built in the mid 1970's . The chanter is lignum vitae with maple ferrules and brass fittings, and pitched in D. Patrick D'Arcy asked if the bottom ferrule was missing so I guess it's worth mentioning that it is not. This is the way the set came to me when they were new. The set was built for me when I was a child, so the bellows strap is a bit short but an extension belt included will fit even the most "robust" player (like me). The original cane reeds are still with it as well as some reeds made by Patrick Sky for me a few years ago. I'm asking $1400US o.b.o for it, which, accounting for inflation, is just about what was paid for it originally. It comes in a a hard case, a small suitcase really, that I have been using as a music case since I've had the set. I will pay shipping and insurance. Sold: Spillane/Keegan D ½ Set - I recently got this set as a trade in and have gone through it with a fine tooth comb, the Chanter is most likely Donncha Keegan and the Drones are likely Davey Spillane, I would say this set was made in the early 1990's when they both worked for Johnny Bourke. My first Practice set was made by Johnny Bourke and had the same bright orange bellows! This set plays lovely, the tuning on the chanter is really good and it has a lovely tone, the Drones have a warm tone and are steady. The set is air tight and easy to play, As well as making pipes I do a lot of restoration work and this set is up there with the good ones I've done. There are some aesthetic issues, the loop on the stock end of the bass drone is on top of the drone instead of underneath, like you'd see on a left handed set, but this has no affect on the sound. The decoration on the baritone drone looks like it was glued back on at some stage, it was put back on straight but you can see a small crack line if you look close. The stock is Ebony and has and interesting decorative ring on it. the bass drone is a wooden type. Sold: vPipes - Sadly I must part with my v-pipes, though I love them dearly. Alden Hackman just refurbed them and they are in perfect working order. Sold: Martin Carrigan D ½ Set - Half Set of pipes, made by Martin Carrigan of Kilkenny. Chanter has 3 keys C, B flat and F natural. Martin's pipes are based on the wide bore Leo Rowsome sets and have a similar sound to the Leo Rowsome chanter. They play themselves, been played and all tested by Eamonn Curran. Case included. Reason for sale: I sell it because I moved to Berlin and cannot play the instrument inside of my apartment. Sold: Kirk Lynch D ½ Set - These pipes play GREAT--they use hardly any air, the drones are very reliable, and the chanter reed takes quite well to being adjusted. Tone is beautiful: rich, earthy, and soft. Lush brown rosewood and brass fittings. INCLUDES ?Varnished plywood "bombproof" case with two latches, accessories compartment, and handle included. Extra chanter+drone reeds. WHY ON EARTH AM I SELLING THIS BEAUTIFUL INSTRUMENT??? Simple, I love these pipes to death and I'm quite proud of owning them, but viola is my main instrument. I need to devote more time to practicing and furthering my classical music career. I'm very sad to part with these pipes, but they need to be put in the hands of someone who can make them shine! $3,000, will cover shipping within continental US. Removed: C.J. Dixon D Practice Set - -Dixon chanter and bag. Brand new John Walsh bellows. Unknown reed maker. Chanter in very good condition. Bellows are brand new. Bag is used. The bag has a small leak. The chanter is rosewood. Too busy to play it. Sold: Michael Vignoles D ½ Set - Materials: African Blackwood and brass Chanter and drones. Chanter has a brass windcap with a stop key and is blocked for keys. Extra chanter reed and drone reeds included. Leather bag with padded bellows. Also comes with a vinyl bag with stocks. Green velvet bag cover with gold trim. The set is reeded by the maker and is playing well in tune. Condition: Used. This set was made for me and is about 10 years old. I am selling the pipes after acquiring regulators for another set. Sold: Bruce Childress D ½ Set - Blackwood, brass, imitation ivory trim. Baritone drone trim piece has a chip (cosmetic only), otherwise the set is in fine condition. Basic black ProTec case is included. The practice set (chanter, bag, bellows) was purchased new in 2011, new drones added in 2013. Bruce says the new owner will have his full support & service for the life of the pipes.... This set served a new piper well for several years, selling only because he upgraded to a full set. Sold: Tim Benson D Practice Set - This is a beginner set and includes concert pitch chanter, bag, bellows, reed and all connection hardware. It has not seen much use as I haven't had the necessary time to practice it. Included with the pipes is a book; The New Approach to Uilleann piping by HJ Clark. Also included is 1 reed and the set does have a C key installed. Thanks for looking! Sold: Jim Wenham D Chanter - Beautifully made Jim Wenham chanter in ebony and nickel silver with boxwood turned cap. The chanter is in superb condition, as per the photos, and sounds great with a bright, crisp sound. The only issue is that the C natural key is sticking a bit as it gets very damp in autumn where I live. Selling because I have sadly decided to give up the pipes, so I am including four spare chanter reeds in the sale. Sold: Andreas Rogge D Full Set - For sale is a full set of uilleann pipes in the key of D made by Andreas Rogge. Made of African Blackwood, brass, and faux ivory mounts, this expertly crafted set has been lightly used, but is still playing great and in very good condition. The current regulator reeds are in rough shape and may need to be replaced, but everything else plays/works well. Very durable hard case included, great for travel. Bought the set last spring, and it has pretty much been sitting, neglected, in its case since then. I wish I didn't have to get rid of it but I could use the money. Brand new from Rogge, buyers can expect a basic D full set to cost over $7,000. My asking price is $5,000 US OBO. Will ship anywhere. Buyer pays shipping and insurance. Please email me for any further information and audio samples. Sold: Hevia Parrado Y Aragon D ½ Set - They look and sound great! Chanter Reed by Brian Bigley. African blackwood, stainless steel drones, brass chanter, Faux Ivory mounts. Selling to pay for a new full set. Sold: Robbie Hughes D ½ Set - A half set of Uilleann pipes made by Robbie Hughes. Reluctant to sell but they have been sitting unplayed for too long due to a new set. The set was made around 2000 and in great condition. Bellows are air tight. It's rare that Robbies pipes come up for sale, I would love to hold on to them but it's not right that they aren't being played. Sold: Andy Faden D ½ Set - I am selling a wonderful and very hard to find Andy Faden D half set Uilleann (Irish) pipes with extra reeds. I purchased this set a few months ago in Dublin, Ireland and hand carried them all the way back to Southern California. They were lightly used before I purchased and after taking several lessons I learned that I have unfortunately a pre-existing condition with my hands/wrists that after extended play....just aggravates my hands. It kills me to let these go but regrettably, the UIlleann pipes are not in my future. I paid 3250 euro plus I flew to Europe so that I may safely transport back to California. I am letting go for $3700 USD and I found that there is at least a one to two year waiting list to get any set of Uilleann pipes of any quality. Please feel free to check around and for a half set you'll be looking at $6-10,000. Sold: Chris Coe D Practice Set - Chris Coe African blackwood, brass and box keyless chanter and Kelleher Traditional Dark Wenge Bellows and Hand-Stitched Bag. The chanter is in excellent condition as it has had minimal use and sounds great, as demonstrated by the sound clips. The bag and bellow are also in excellent condition and are barely played in. Together they cost over Euros 1600 just a couple of years ago, but I will accept Euros 950 for a quick sale. A great opportunity to obtain a high quality practice set at a very reasonable price! Sold: Richard Patkos D Chanter - Plumwood chanter with ebony mounts and brass reed cap. Decent reed included but if you make reeds this would be a good project for you. All reasonable offers considered. Location: Los Angeles, U.S. of A. Sold: Seth Gallagher B Full Set - Ebony, Brass and Artificial Ivory, made by Seth Gallagher. They are about 6 years old and have been continuously played since. The set still uses the original set of reeds and quills, but they are fully in tune throughout and have never needed retuning. Cane quills in drones, and cane reed in Chanter, Metal bladed regulator reeds. Chanter fully keyed with stop key also. There is a hard case included. The set plays beautifully. We're selling to pay for a historic set we bought recently. Set would cost $8,700 new (About �7600). Selling for �6500, or nearest offer. Sold: David Daye D ½ Set - I purchased them in August and am selling them because while I adored giving them a go, they need a devotion I can not offer. I'm asking $1275 for them. MISSING: Under Investigation Seth Gallagher ¾ Set: Serial #300. Lost in shipment by UPS from Hiram, OH 44234 to Basom, NY 14013 on 14 December 2015, tracking #1Z4888730310172652. $2000 reward for information leading to recovery. Sold: Colin Jerry D Chanter - This Uilleann pipes chanter in D was made by the late Colin Jerry of the Isle of Man. It is in African blackwood with C key, brass windcap and imitation ivory ferrules. It's a very fine instrument and I'm sad to part with it. It comes reeded by Alan Burton with a spare Burton reed as well. I met him when I was just starting out on the instrument with an impossible chanter. I later used it to light a fire but at the time I'd been struggling with it for months. I picked up Colin's set of pipes when I was on the Isle of Man on a Welsh clog dancing tour and suddenly anything seemed possible. As a result he gave me lots of good advice and made me this chanter which is for sale now. It has the same lightness and elf-like quality that I remember of the man himself. We pipers are always in search of the perfect chanter as much as the perfect reed, and for maybe 10 or so years this chanter fitted the bill for me. I know buying musical instruments over the internet is a difficult thing. What I can say is that I've played a few chanters � some so strong they tired me out (the biceps on some pipers!). This one lighter, easier and softer in tone. You are welcome to try before you buy if it is at all possible for you to get to west Wales. I'm happy to answer any questions. I have added a generated D drone in concert pitch to give you an idea of the tuning. Otherwise they are pretty basic, recorded at home with a computer mic. I'm no master piper, especially when there's a mic in front of me! I'm desperate to get my hands on a set of Scottish smallpipes and this is the only way I might be able to pay for them, so there it goes. Sold: David Daye Practice Set w L&M Bag - Hardly used. Everything in excellent condition. Selling because I don't play them. Will ship from Vancouver, BC. Listed: 07/20/2013 Sold: "A long time ago." Sold: Andy Faden D ½ Set - Andy Faden 1/2 set in Ebony and Boxwood. This instrument was recently reeder by the maker and is playing beautifully. The 1/2 set comes with a Cillian O'Briain Bellows and bag. Sound files can be sent upon request. Sold: Charles Roberts D ½ Set - made from African rose wood, and brass. The chanter has one key f natural, and a chanter stop (cuts air flow with a lever). The set is fully reeded, with original chanter and drone reeds, working perfectly. Drones need to be tuned, as they have not been played in a while. Set comes with a black fibre glass case with velvet foam base, also a spare drone reed and chanter reed (needs adjusted to chanter). I had these pipes made for me in the late 1990's, I played them for a few years receiving some lessons from Charles's son Allen, but then set them aside, playing them on rare occasions. These pipes were made to be played regularly and I would like to give someone else the opportunity to do just that, as I am not. The set has been looked after, brass cleaned, and almond oil used on the wood. Please note set comes with a green velvet bag cover, not in photos. Asking price �2150, this includes packing, shipping, and insurance (through a courier approx time 3-7 working days, door to door). Please note this is a price from Ireland to the US, if living somewhere else please contact me, and the price can be adjusted. I am also open to collect in person, I am based in the West of Ireland. Sold: Charles Roberts D ½ Set - Charles Roberts, halfset in concert D, two keys on the chanter. Made ca 1995. The chanter was re-reeded when I bought the set in 2008, and it is still playing well. Bass and baryton drones are fitted with synthetic reeds (from PipeDreams in Glasgow). The tenor drone was re-reeded by Donnacha Dwyer this summer. This is a nice beginners instrument. I am selling to invest in regulators by Martin Preshaw for my other set. Sold: Brian Bigley D Practice Set - These pipes were made by Brian Bigley last year, for me. They are like new, and I have had the opportunity to play them very little. The set has no issues that I know of. Honestly I am too new a player to really be able to analyze subtle issues, however, I have never had any difficulties (other than my own skill limitations, as I learned.) Suffice to say, they have been treated well, and were built by a reputable crafter. The pipes feature a black leather and walnut bellows. The bag is brown leather, ebony and brass, and the chanter is ebony and brass, with faux ivory. The only reason I am selling these pipes is financial I have some other obligations, and so unfortunately, my pursuit of the Uilleann Pipes has to wait a bit longer. There is nothing at all wrong with them and they are barely a year old. They really are a gorgeous practice set. I very much hate to part with them. The new owner will have a fine instrument in their hands. Sold: Cillian O'Briain ½ Set - This half set I purchased from Cillian O'Briain at his workshop in Dingle in April 1990. After about a year I realized I had no talent for learning or playing the pipes. They have been stored in their original case since. I have maintained the leather and cleaned the wood and brass. The soft rubber flex tube between bellows and bag has cracked and needs replacement. In all other respects the pipes are pristine. Please see the photos. I would be delighted to see and hear this set in competent hands. Sold: Alain Froment C Full Set - I'm selling a Full set in C by Alain Froment, made in 2005 in Kenmare co. Kerry, just a little before Alain moved to his new house in Brittany. It is made in ebony, stainless steel, artificial ivory. The bag is original and still working; has a velvet navy blue cover. The chanter has two keys, C and F, plus stopkey. This instrument has always been treated with much care. I never bring it to a session, I only played the chanter a couple times in concert, but it didn't get out of my home for the rest of the time. So, it has no cracks or any other kind of damage. The reeds even are original, with the exception of the middle reg and chanter reed that has been changed. Down you find a link with a slow air I recorded with this set. The actual value of Froment's instruments is very high, so my economic request is adequate. I gently ask to anyone interested to send me a private message for the price. As you know, it is not only a excellent quality instrument, but also a good investment, intended to increase its value with time. Obviously, due to the high value and fragility of the instrument, I won't send it by post, if a deal is found I will deliver it in buyer's hands. The reason for selling is I am getting a set from another maker, that is also very expensive and I have been waiting very long for, so the only way for me to get it is, sadly, selling the Froment's. If you want to see photograohs or have questions questions, don't hesitate to ask. Thanks a million!! Sold: Bruce Childress D Full Set - Concert pitched in D - African Blackwood, Brass, imitation Ivory Mounts, MacHarg Bag. The bellows were improved by Bruce in 2010. The set is still just as good as new. The chanter: from being a keyless chanter at the start of my ownership, it was improved with four keys, a stop key, and a popping valve in 2012. If you want to use the set as a practice set in the beginning, a wooden stopper comes with the set for the drone stock. BC has been very helpful during the time I had the set, and he will honor a transfer of full warranty to the new owner for life. For further questions you may contact BC through his website: www.bcpipes.com BC will answer all questions. I was from the beginning a Great Highland Piper and have three such sets in my collection, in addition to a few stringed instruments. I wanted to learn the Uilleann Pipes but as I have found them to be quite different to Highland Pipes, they will probably take me too much time for me to learn. I did however learn a few beginner tunes when using the pipes as a practice set, but I have not spent any more time on it since 2013. Recently I turned back to the Great Highland Bagpipe which I obviously play better than the Irish pipes. So hopefully they will get a better home with someone else who has the time and the effort to learn them? If you decide to buy the set, I can ship it to you through Childress who checks the instrument, at no charge (except shipping), before he forwards the set over to you. A great present for yourself! No waiting a year or more for a new set from Bruce Childress. A new set of this standard costs currently $6426. Sold: Kevin Thompson D Full Set - I am listing these for an ex-student who has recently decided he does not have the time to learn. These pipes were made by Kevin Thompson. I do not have many details, sorry, but they were previously owned by Pat Broaders and Brendan McKinney (who switched them from lefty to righty and won a couple of US fleadhs with them!) Brendan only sold them because he received a Froment set. He said he had sent them to Seth Gallagher for a tune up and by the time they came back, they were going so well he almost didn't want to sell them. Myself and Jack Devereux have done some minor work to them to get them airtight and going again as they were dormant under the bed for almost a decade. They could still use a little more attention but are definitely in nice shape. Most likely blackwood and imitation ivory with a bass regulator bar - can't be sure of the materials. The chanter is keyless - it has a hole for high C but it has been patched over and there is no key in sight. There are mounts for other keys. I have an old Benedict Koehler reed in the chanter and it is playing quite nicely. I will include that with the sale. I think the drones and regs could use a little fine tuning and the bellows could use some work on the blowpipe - just a plastic tube right now - but, this set has the potential to be a lovely full set for any player. I am getting this together quickly for the owner but i will try to include sound samples and better pics at some point. Please mail me for those as well if you are interested. Listed: 08/12/2013 Sold: "Years Ago"
Sold: Uilleann Pipes Practice Set - Maple stock, African Blackwood drones. Leather bag (Elk) made by Mike MacHarg, with rivets. Lightly used. Had two strokes, and lost use of left hand. These lovely pipes should go to a good home. Sold: Old D Practice Set - Old practice uilleann pipes. No reed. Bellows straps missing. Wood is rosewood I think. They look fairly old. Sold: Alain Froment D Practice Set - Excellent condition. Like new. Email for more photos & information. Enat is classic style "wrap around". Michael sent two reeds: cane- which I prefer (at least till the humidity in the Northeast goes south) and spruce, which he prefers for his flat sets. It might take some getting used to. A bit hard w/ a different timbre. Not bad- just different and needing to be played in. Sold: Geoff Wooff D Set - I'm considering selling my full set of Geoff Wooff uilleann pipes in ebony, brass, boxwood mounts. Pitched in D. These pipes are not a narrow bore but a "middle" bore set with volume similar to a fiddle - yet still retaining that sweet flat pipe tone. Made for me while Geoff was living in Milltown Malbay Co. Clare. They have all the usual Wooff features - fully keyd chanter, hollow stock, sliding bass regulator, handmade bag and bellows etc. There is a small chip off the tenor drone boxwood mount, and one of the bellows hinge screws is missing, both could be replaced. Unique set. Serious offers only please. Sold: Seth Hamon D Chanter - Uilleann pipe chanter by Seth Hamon. I know virtually nothing about uilleann pipes, so glean what you can from the pictures. Not sure of the key, but from the top of the reed seat to the bottom of the chanter is 14.5 inches. Unsure of the wood. Brass fittings & one brass key. Several other unused key blocks. Comes with a pair of chanter reeds. Seth lists new chanters for $500. Sold: Pat Stones D Drones - I am selling a concert pitch (D) set of drones made by Pat Stones (UK) in 2004. It comes with a new L&M Uilleann pipe bag, which replaced the original bag. The nifty, as well as a nifty, large double padded MacWarmer bellows. When I played the drones last they played brilliantly, but the reeds definitely require some tweaking and adjusting now. I'll include the original Pat Stones chanter, and a David Daye penny chanter, too. The set is made of Ebony, imitation ivory and Silver Plated brass. I am the first owner. I used to be quite an active member of the pipers community (Tionols in Ireland, Miltown Malbay, NPU membership, reed-making workshops), but those days are over, unfortunately. I can send the set in the original heavy case, but the shipping then will be expensive. I am willing to send the set completely taken apart safely packaged in a lighter box. The video is from 2008, the chanter was a Van Daal chanter. I used the drones with a number of my chanters: Rogge and Wenham. Sold: Bob May D Practice Set - Chanter and bellows by Bob May. Bag by CJ Dixon. Airtight. Great for first set. Asking $750.00. $25 shipping in the US. Actual cost elsewhere. Sold: Chris Bayley D Practice Set - Irish pipes made by highly praised Uilleann pipe maker Christopher Bayley, consisting of a bag, bellows, connectors, spare tubes, spare reeds and chanter. The Chanter is ebony with a brass C natural and mammoth ivory fittings. Its also has the blocks for additional keys to be fitted and features Chris' comfortable thumb rest and elegant shape. It also has an additional 5 reeds all made by Chris and has a Steve Turner reed in the chanter. There is also so spare tubes at different lengths for connecting the bag and bellows. The chanter reed is very soft making it very easy to play and reaching the second octave is easy, it also has a solid hard bottom D.
Sold: Tom Aebi D Chanter - Concert chanter by Tom Aebi in ebony, with G#,F nat, and stop nickel plated keys, boxwood mounts. It's not his Kennedy model, but he describes it this way "Rowsome-ish Aebi chanter; warmer and smoother than the 2009 (Kennedy) chanter. It is very well tuned, just not as straight forward as the 2009 chanter which has perfect octaves. Sound is more creamy and more fruity (...than the Kennedy). It comes with two reeds that he describes as: "bright is my regular reed with parallel sides and an adjustable wire bridle... warm is a of the new style I am experimenting with, it has a fixed bridle at the base and a curved head. This chanter has the best tuning of any chanter I've played. Sold: Gordon Galloway D Chanter - I am selling a Gordon Galloway Chanter, concert pitch. Holly Chanter with purpleheart mounts, C nat key! Selling to finance a new lathe. It comes with no reed. I bought this chanter 3 years ago from Ciar�n Mac Fheidhlimidh, you can hear it here. Sold: Seth Gallagher D Practice Set - Deluxe Practice Set Key of D. Ebony and Nickel-Silver with Imitation Ivory. Blocks for 4 keys. Paid $2500 last year after a year wait. Must sell as I do not have time for them and have a family situation that I nedd the money for. New reed from Seth in February. Please email if you wish a short video clip for me to send. Sold: Kenneth McNicholl B Chanter - B natural chanter for sale. It was made in February 2010 by Kenneth McNicholl. The wood is purpleheart. Its design is based on a Coyne B chanter. The reed is in good condition and it is playing well. It has no keys or blocks for mounting keys. I am asking $800 + shipping. Sold: Martin Preshaw D Chanter - With four keys. Six months old and as new playing beautifully. Made of ebony, stainless steel and false ivory. Sold: Antique Practice Set - This set was found in Newburyport, MA back in the 90s. There is no definite attribution to who made them, but a guess would be Patsy Browne. The set contains the following: A leather bag with ferrules, a set of stitched bellows, rubber blowpipe, a green velvet bag cover, a Tayloresque chanter, and a wooden carrying case. I have never tried inflating the bag, and would be hesitant to do so. The bellows are nicely made with a heavy metal hinge and a sleeve protector, but the gusset leaks. It has a threaded connector to attach the blowpipe which is made of heavy, stiff heater hose. The chanter is very much in the Taylor style with real ivory mounts and nickel/silver keys. All the keys function well. There is a foot valve with two adjustment screws which also functions properly. The wind cap has a stop key. I replaced the stop key's leather valve. The chanter came with the remains of a reed. I tied a new head on it but never spent the time to find the correct reed dimensions. The reed is not currently working. The carrying case is made from oak and is in somewhat rough shape. In the bottom of the case there is a folded up newspaper with the date: September 20, 1936. I consider this a valuable historical set, but it has been gathering dust in a corner and I would like to pass it on. Sold: Martin Preshaw C Full Set - Martin Preshaw Full 'flat set' pitched in C : Stainless steel and Ebony with a fully-keyed chanter. This is one of Martins early flat sets (2009) and is in excellent condition having never been to a pub or been played in public. The chanter is Superb and so much so that I considered keeping it and selling the body separately. But that would have been deeply uncouth. The set is airtight, the bellows are beautiful ( best I've ever seen/used) and the drones are great. The tenor and baritone Regs are almost there but the bass might need a new reed or some serious twiddling. Check out the sound on Youtube - the first part features the chanter & drones of this set. Sold: Brad Angus B ½ Set - Brad Angus B 1/2 set with case, 2 working reeds, and a staple mandrel. Drones and Chanter are made from ebony with Brass fittings and keys. Chanter has a stop key and 5 other keys. Plays and sounds great. Comes with a larger hardshell mountain dulcimer case and a boxwood handled staple mandrel. No bellows. I would consider selling the Chanter separately for $2075 US OBO. Removed: Tadhg Crowley D Full Set - Historic Set of Crowley Pipes. A unique opportunity to acquire a vintage 1930's Tadgh Crowley (1899- 1952) full set of pipes in fine condition. Including the original bellows with the "T. Crowley Cork" insignia. This is a set for the serious collector and /or player. The offer includes all the original parts with the Crowley makers stamp throughout, plus extra additional improvements made in the 1970's , eg a second bass drone soundbox, an additional set of regulator tuning pins etc which the new owner can make use of or not as he wishes. The chanter has a C key and the Crowley stamp, and sounds clear and bright. The set has been overhauled and comes with a brand new bag. Set is located in the U.K.
Sold: Geoff Wooff C Chanter - This instrument is constructed from ebony with faux ivory decorations. C natural, F natural and a stop key are fitted. The chanter was recently serviced by the maker and comes with a spare reed. Sound files available upon request. Sold: BC Childress D ¾ Set - The pipes are in cocobolo and brass and are fitted with Bruce's reeds throughout. They are in good playing order. Bag, bellows and drones made in the mid 90s. Tenor and baritone regs added around 2007. New chanter in 2012. I will have the pipes at the East Coast tionol in a couple of weeks' time if anyone wants to try them out. Sold: Andreas Rogge C Chanter - I am selling a nice example of an Andreas Rogge C Uilleann Chanter. It comes complete with 2 brass keys. Chanter is completely new, still in the box in which Andreas Rogge sent it to me in March 2015. Made of Ebony, imitation ivory and brass keys. I am the first owner, I ordered this chanter a number of years ago, in the meantime, though, I gave up Irish piping. I used to be quite aa active member of the community (Tionols in Ireland, Miltown Malbay, NPU membership, reedmaking workshops), but those days are over, unfortunately. Sold: Joe Kennedy D Chanter (Left Handed) - Left-Handed Narrow Bore D Uilleann Pipe chanter made by Joe Kennedy in September 2011. •Canadian Applewood with brass and European Boxwood mounts. •The chanter is a copy cross between Kenna and Taylor. •Chanter top swan neck type. •2 reeds made by myself Fergus Maunsell with rolled staples in my reeds by Bill Haneman and also 2 other reeds. •Chanter can be played Right-Handed with or without brass keys. •The chanter keys all working great and the brass keys can be used both by left-handed and right-handed with no problem. •Right-handed player will be able to reach the chanter keys with out any difficulty. •Chanter is in excellent condition and playing great. Contact me for sound files and more photos of chanter. Sold: Andreas Rogge C Chanter - Rogge C chanter, keyless, in plumwood, artificial ivory mounts, and brass ferrules. It's his newer design, wider bore, with that flat sound, good tuning and responsiveness, not too loud, but with plenty of presence. About 2 years old. Sold: No Name D ½ Set - I received this half-set in trade from an amateur pipe maker in Utah several years ago. The pipes are concert pitch (D). The chanter and drones are made of blackwood, brass, and art. ivory. Unique compact drone design with "trombone" style tuning slide on the bass drone "U bend". Bellows are by Neil O'Grady. Bag is leather L&M. It is air-tight. I have a couple of spare chanter reeds with the sale. Please contact me for sound sample or to get additional information. Sold: Joe Kennedy B Chanter - Ebony 4-key B chanter for sale! I am selling, because I just received my Full B set in Pear Wood from Joe. This is a seriously expressive chanter w/bags of tone! Sold: Andreas Rogge C Full Set - This set is made of Ebony with sliver plated key work and boxwood mounts. Chanter is the new bore with a richer warmer tone and is fully keyed (stopper key in sterling silver) The set has a few extras including baritone and tenor regulator tuning slides, pin mounted regulator keys, Detachable bass regulator with sliding stock hole cover, H bar on the bass drone, Fiddle back key design on the regulators, stock plug so the can be used as a practice set, and a set of D drone sliders so you can plug a D chanter in and use as a half set!! Hard case and real of red hemp. The set is Six months old and playing beautifully. Sold: Richard Patkos B Chanter - Flat pitch B chanter in ebony with faux ivory mounts and brass fittings made by Richard Patkos. The chanter has no keys, but is fully blocked, including a stop key block on the wood top. Comes with original reed. Sold: Michael Hubbert D Practice Set - 2011 Hubbert Practice set. Ebony chanter with boxwood and brass. C nat. key and F# key. Hubbert cherry bellows with stamped design. Michael's L&M bag with ebony stocks. Heavy rubber blowpipe with brass and ebony fitting. I am the original owner of the set. Near mint condition. Airtight bag and bellows with zero issues. Traded: Ray Sloan D Chanter - Very well made chanter in ebony, silver and faux ivory. Plays well. Includes a C key. All reasonable offers considered. Sold: Gallagher/Quinn/Shaw C Full Set - Beautiful curly maple chanter made by David Quinn. Has F nat, G Sharp and C keys and was reeded by Paddy Hyland. The drones and regulators were made for the chanter in 2009 by Seth Gallagher and are constructed from ebony, brass and boxwood with all original reeds. Dave Shaw made the lovely hand stitched bellows, note the double intake valves. Set is in excellent condition, airtight and plays beautifully. The pipes fit nicely into a solid Gator flight case which is also included in the sale. Reduced to sell at �4800 ONO. Sold: vPipes Electronic Pipes - Vpipes for sale. The best uilleann pipes emulator on the market. Comes in a lightweight foam padded aluminium flight case with keyed lock. In perfect working order and ideal for practice when playing the real uilleann pipes is impractical or not possible such as in an apartment, hotel or on a campsite. I'm only now selling them as I am currently not working and need the money. I am in the United Kingdom but am in Ireland between 20th and 30th December so any purchaser in Ireland can arrange to collect them in person.